One of the unique things about Maastricht as a city is that you can go from the city centre to the rolling hills of the countryside in no time. If you didn’t know better, you’d think you’ve left the Netherlands behind. You'll feel like you've crossed the border, but you're not quite there yet. 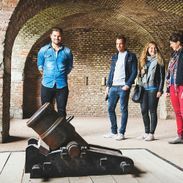 Maastricht has a very central location in the Euregio and shares a border with Belgium. But you don't really feel it until you see how the city, and the countryside around it, is layered with a unique mix of foreign influences. After being closed for a long time, the decision was made on 5 October 2017 to reopen the ENCI quarry to the public. Visitors who want to enjoy nature are welcome again from that moment on. Combine your visit to the ENCI quarry with a lovely walk along St. Pietersberg hill. From Luikerweg, you can climb the hill and walk past Chalet Bergrust. If you fancy a longer walk, keep right at the top of the hill and go on a fantastic stroll to Kanne (Belgium). You can also take in the view over the ENCI quarry and even go to the lookout – complete with binoculars! If you are looking for a moment of peace, the rural district of Sint Pieter is the place to go for a relaxing walk in nature. A local tells their tale.